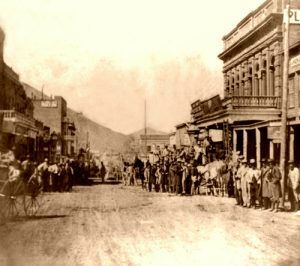 Virginia City, Nevada – Pioneer Stage leaving Wells Fargo, by Lawrence and Houseworth. 1866. Click for prints, downloads and products. But like other mining boom towns, Virginia City would eventually begin to decline, beginning in 1877. From the time it was first established through its decline, Virginia City suffered five widespread fires, the worst of which was dubbed the “Great Fire of 1875,” which burned nearly 75% of the town and caused some 12 million dollars in damages. But the residents persevered and the town was rebuilt in about 18 months. The Comstock Lode was fully mined by 1898, and the city once again took a sharp decline. 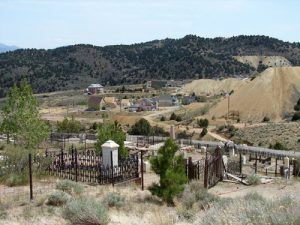 During the years from 1859 to 1919, more than 700 million dollars in gold and silver taken from the mines of the Comstock Lode, which mines’ were excavated to as much as 3200 feet. By 1920, there were just a few small operations in business and by 1930, only about 500 people lived in the community. Today, the historic community is a National Historic Landmark, designated as such in 1961. It now boasts about 1,000 residents, and though a shadow of its former self, it draws more than two million visitors per year. Numerous historic buildings continue to stand including Piper’s Opera House, which still entertains customers today and the Fourth Ward School, built in 1876 which today is utilized as a museum. Numerous mansions also continue to stand which provide visitors of the sophisticated and lush lifestyle of these long ago residents and the Virginia & Truckee Railroad runs again from Virginia City to Gold Hill. The landmark is the largest federally designated Historical District in America is maintained in its original condition. “C” Street, the main business street, is lined with 1860’s and 1870’s buildings housing specialty shops, restaurants, bed and breakfast inns, and casinos. As a federally designated National Historic District, it is illegal to dig for artifacts, remove any found items from the community, or mistreat any property. 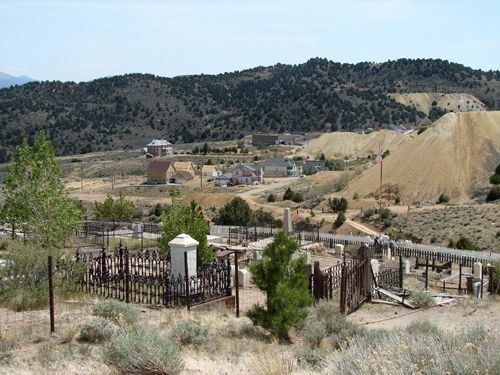 One of several historic cemeteries in Virginia City, photo by Maureen Skoblar, May, 2007. Virginia City is located about 23 miles south of Reno, Nevada. Compiled by Kathy Weiser/Legends of America, updated March, 2017.